Justyce is top of his class, captain of the debate team, and set for the Ivy League next year—but none of that matters to the police officer who just put him in handcuffs. He is eventually released without charges (or an apology), but the incident has left Justyce contemplative and on edge. Despite leaving his rough neighborhood, he can’t seem to escape the scorn of his former peers or the attitude of his prep school classmates. The only exception: Sarah Jane, Justyce’s gorgeous—and white—debate partner he wishes he didn’t have a thing for. Struggling to cope with it all, Justyce starts a journal to Dr. Martin Luther King Jr., but do Dr. King’s teachings hold up in the modern world? Justyce isn’t so sure. Then comes the day Justyce goes driving with his best friend, Manny, windows rolled down, music turned up (way up), much to the fury of the white off-duty cop beside them. Words fly. Shots are fired. And Justyce and Manny get caught in the crosshairs. In the media fallout, it’s Justyce who is under attack. 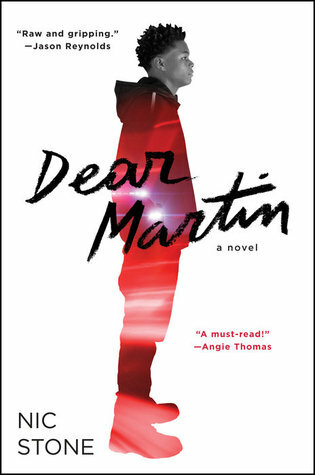 Dear Martin has quickly been labeled a must read book for 2017 and overall I agree with that conclusion. Let’s get something out of the way though: the biggest disadvantage this book faces is that it was published in the same year as The Hate U Give (THUG). The authors are friends and the books deal with similar subject matter, so comparisons are inevitable. Readers of THUG will notice several points of overlap: Black protagonists who attend private schools, are in interracial relationships, live/grew up in a high crime area, witness a police involved shooting, have a prejudiced parent, have a “friend” who doesn’t understand the complexities of White privilege, etc. To be clear, addressing issues of racism and police brutality in fiction is incredibly important and the more novels which deal with the subject, the better. Dear Martin is designed to meet a need for modern readers, giving an insightful and in depth look at what it’s like to be a Black man in America in 2017, and it doesn’t hold back. The book packs a powerful emotional impact. My heart raced, I cried, and, above all, I got angry. Invoking such emotions in a reader is no small feat. For me, the parts of the book which provoked the most intense reactions were the depictions of Justyce in the media after he is shot by the off-duty cop. It’s heartbreaking to see the ways in which he has to navigate life after news reports insinuate he is a criminal rather than a victim. Stone’s commentary on how media narratives contribute to racism and influence our perceptions of victims resonates in part because it is easy to recognize the real world stories which inspired her writing. It’s timely, relevant material for young readers who may be struggling to understand why stories about police shootings and media depictions matter. While the book portrays the struggles of Black Americans, it does so by contrasting their lives with the White Americans with whom they interact. For readers who have never considered how racism continues to impact the Black community this can serve as an introduction to those realities. However, I felt some characters were there to check boxes; Blake, the unrepentant and clueless racist; Jared, the White dude whose racial views drastically evolve throughout the book; Melo, the on-again/off-again girlfriend whose actions lead to Justyce’s first police encounter. Nevertheless, they serve the purposes of the narrative well and I never felt like they were out of place (except Melo, who basically disappears from the book at some point, and I did not miss her). The book also touches on the ways that limited exposure and negative interactions between people can create stereotypes and prejudices as many of the characters have no experience with the Black community beyond their encounters with Justyce, Manny, and the few other Black students at Braselton Prep. They deal in stereotypes or use their classmates as “evidence” that systemic racism does not exist. Stone’s work extends this discussion of discrimination as she touches on anti-Semitism through the character of Sarah Jane. At multiple times in the book when she is referred to as White it’s followed by a reminder that she is Jewish. While this does not mean she experiences the same disadvantages as Justyce, it is a friendly reminder to readers that prejudice takes many forms. Unfortunately, this is actually a way in which the book fails for me. Obviously Justyce’s story and life extend beyond his mistreatment by the police, but a significant portion of the book focuses on the fact that Justyce’s mother doesn’t want him dating White girls. Unfamiliar readers can project onto this, and it could feed into a narrative of “reverse racism” (which doesn’t exist, by the way). Additionally, Stone’s premise of having Justyce engage with the work of Martin Luther King Jr. was intriguing to me. Quite often in narratives surrounding modern protest, dissenting voices like to argue that “this is not what Dr. King would do,” and Stone’s work is directly engaging with that flawed argument (flawed because those critiques ignore the true experience of MLK in the 1960s and turn him into a convenience). Justyce’s attempts reflect this complexity as well as the problem of applying philosophical frameworks in an effective way. His struggle, and at times abandonment, of being “like Martin” helps demonstrate that communities and movements cannot be distilled into one voice. I was a bit confused though because from the promotional materials, summaries, and title, I assumed that much of the book would center around Justyce’s journal addressed to King, but the book is not epistolary and the letters are so few and brief that they are largely extraneous to the plot, which is a shame because they are beautiful. We see Justyce develop and grapple with societal questions clearly in those moments because they are written in first, rather than third, person. As a side note to that, I had two main critiques of the work itself. I wasn’t always happy with Stone’s use of point of view which was predominantly third person limited. At times it read as stage directions or a script, which worked well for the conversations but made larger scenes and time jumps seem stilted. I also did not like the opening of the book. It’s a move I’ve seen more and more (including in THUG) but opening with an incredibly dramatic scene (Jus’s unlawful detention) does not work for me. I objectively understand: my empathy for victims of injustice should not require an emotional connection to the person, but I find it jarring. It took me until around Chapter 5-6 to finally connect with the characters and engage with them as rounded figures. Those early chapters felt like reading a play built out of stock characters and part of that was down to the recoil I felt from the opening. There are other things I could discuss in this review. The depictions of successful Black men (Manny’s father (a businessman) and Doc (a teacher)), the humanization of gang members and the incarcerated, and on and on. For a short book, it manages to contain a multitude. However, I think the main thing to take away from this book is that it adds to the conversation by giving readers an opportunity to learn, reflect, and engage with a narrative that many have seen played out on TV but haven’t really thought about or considered from the perspective of those living these experiences. While it isn’t perfect, for me this was a four bard tale, without question.